Stacey Gluberman Trotti was scrolling through her Facebook feed one morning in late June when she came upon a disturbing post a friend had shared. 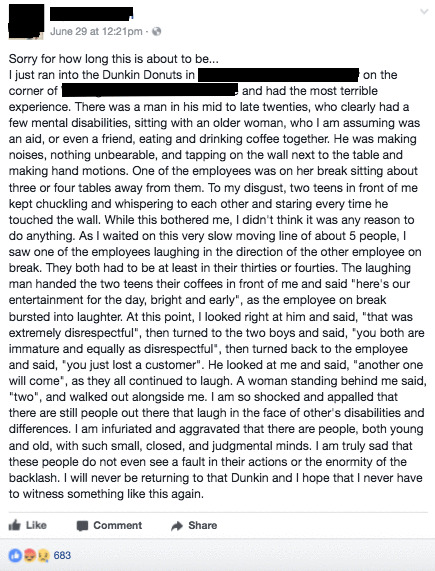 It was written by a young woman standing in line at a Dunkin Donuts. The two teens in front of her had been laughing at a young man seated at a table nearby who was making noises and tapping on the wall. When they put in their order, the employee behind the counter—who'd also been laughing at this young man—handed them their coffees and said, "Here's our entertainment for the day, bright and early." 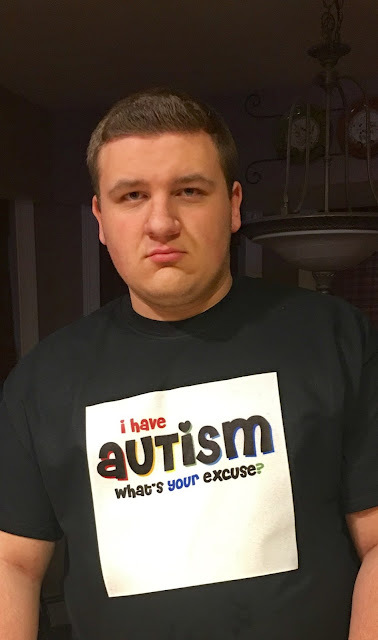 Horrified, Stacey realized the young man they'd been laughing at was her son, Jake, an 18-year-old with autism who stims with humming and tapping. He and his aide, Lisa, regularly stopped by this DD as part of their morning routine. As soon as Lisa arrived that day, Stacey showed her the Facebook post. Yes, Lisa confirmed, that was them. She said she'd chosen to ignore the teens; she hadn't realized employees had been involved. "Thankfully, Jake didn't understand that people were making fun of him. I was angry, hurt and disgusted—all of the emotions," says Stacey, who lives in Long Island, New York. "But I didn't lose it, I went into advocate mode. I wanted to get over there and address it." At the store, she told the general manager what had happened and how disgusted she was. She wasn't alone: "Apparently, other people who'd seen the post on Facebook had come in and said things, and the store was also getting phone calls," she says. Back in her car, Stacey says, "I broke down. As I sat there, the owner called. He was very upset, and said he'd investigate what happened. Then I went home and cried more. When I told my daughter, who's 15, what happened she also got upset. She is very protective of her brother—she always wants to confront people who stare." 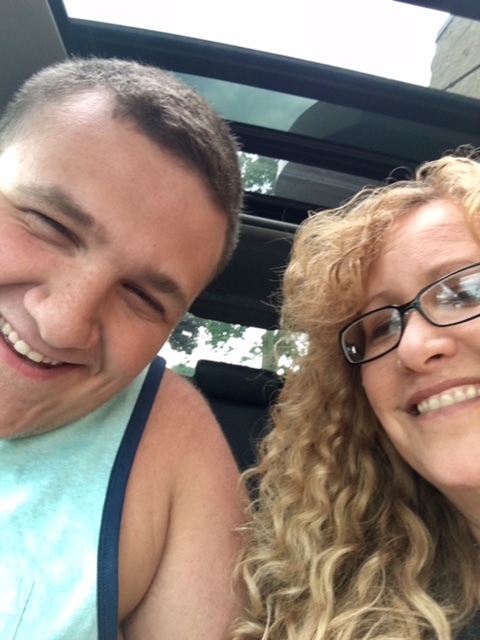 Stacey shared the post on Facebook, noting, "I have to be my son's voice/advocate and unfortunately educate others.... Let's hope that some sensitivity training is put in place. That's the only good thing that can come from this." After more pondering, Stacey called the owner back. "I told him something else needed to happen besides an apology," she says. "I wasn't sure what. But I didn't want it to be just me complaining about one issue—I wanted it to be for the good of our children." Meanwhile, her post went viral, and she was comforted by what she describes as "a tremendous outpouring of support from the local autism community." Soon after, a friend connected her with the Nassau/Suffolk chapter of the Autism Society. Stacey spoke with the head of it, Suzanne Reed, and they scheduled a meeting with the owner to see how they could move forward. That took place in early July. The owner had reviewed the videotape and saw the smirking employee. He informed them that he'd been removed from the store. The women also found out that while employees view a 15-minute video involving how to treat customers with disabilities, it featured only people with physical disabilities. "We had to explain to him that people with autism can look typical," says Stacey. "My son may look like a young man but he's childlike and he stims. Employees need training about that." The owner was interested in training for his store, as well as others in the area. Stacey, a social worker at a school for children with disabilities, has offered herself up; she might partner with a staffer from the National Autism Society down the road. "I really appreciated it when the owner said, 'Where parents fail, society needs to teach the kids,'" says Stacey. "He felt really badly. He also talked about doing education in elementary schools and bringing in donuts. And we discussed the possibility of having a person with a job coach do some work at the store." It doesn't matter which Dunkin' Donuts this occurred at. It could have happened at any store, anywhere. It was revealed because a caring young woman spoke out against the egregious behavior she witnessed. The owner was appropriately apologetic. responsive and prepared to make good. Still, it does make you wonder about what kind of disability awareness training employees in this country receive. Stores and companies would do well to make sure staffers understand the basic tenets of respecting customers of all abilities. Also, a word to clueless people who think it's amusing to make fun of people with disabilities: If your boss doesn't catch you, social media just might. Jake and his aide recently returned to the store, says Stacey, "and he was treated like a king! The employees were very friendly. Jake likes to flick string, and one of them asked why he did that. I was glad she asked. " Although Stacey's sad that this happened, she's pleased with the outcome. "A part of me thought, I don't want to deal with this, but then I thought, I have to educate people and let them know it's not OK to ridicule children, teens or adults with special needs," she says. "It's bigger than just me and Jake. It's about treating any kid with autism with respect. Our children are out there—at the gym, at the beach, and in society with everyone else. You can't control the customers, but you can teach employees." Sensitivity training is indeed a good thing if done well. I hope everyone who knows doughnuts - knows people. I liked the conciliation hearing with Suzanne Reid. Had just read about Long Island in the World Book Encyclopedia. Can get a good picture of Jake and Lisa. And getting a burning stare from a 15-year-old sister. That would be enough to stop in the tracks. "By our stims you may know us". And it was interesting to see the kind lady who wrote the Facebook post thought Jake was a few years older than he is. Many of our doughnut stores/stalls don't have walls. They are clear in the middle of the market or else on the foyer. So no walls for Jake. This kind of behavior is forever taking place against disabled, elderly, overweight, and mentally challenged individuals. We need to stop cruelty of the disadvantaged individuals. There should be a law. Laughing at another's expense is down right demeaning, no excuse for such behavior. Everyone has feelings and this is exact to children committing suicide for being bullied. Think about it, what if the person were your child. Go Jake you rock - plus you are cute too !